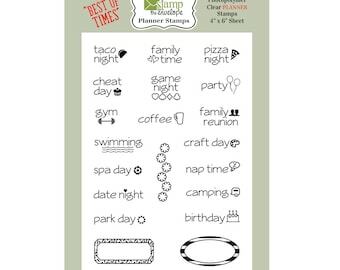 Custom stampers, signs and prints! Announcement Welcome to Stamp The Envelope! Want to see a proof *BEFORE* you buy? We're happy to do that! 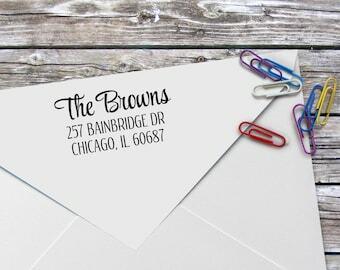 We're your shop for personalized return address stamps, as well as wedding, business, logo and planner stamps. 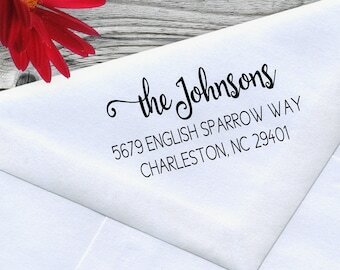 Let us create the personalized stamp YOU want for your home, wedding, Etsy shop, office or business. 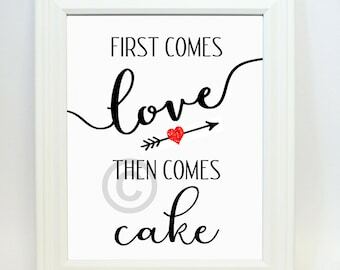 We do custom orders in various sizes and fonts. 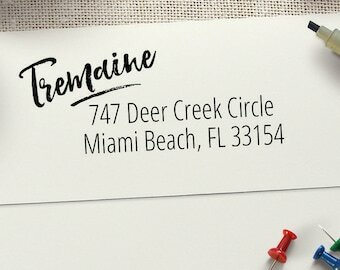 We use pre-inked stamps that are good for lots and lots of impressions. A separate ink pad is not needed which makes this stamp much more convenient to use. Stroll through our shop to find the personalized stamp or gift that's perfect for your needs. We also have coasters, signs and digital downloads, designed by us, for weddings or as fun and thoughtful gifts. 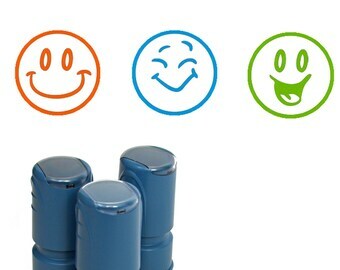 If you don't find exactly what you want, please let us know and we'll work with you to create it. Welcome to Stamp The Envelope! Want to see a proof *BEFORE* you buy? We're happy to do that! 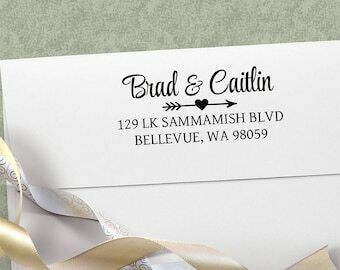 We're your shop for personalized return address stamps, as well as wedding, business, logo and planner stamps. 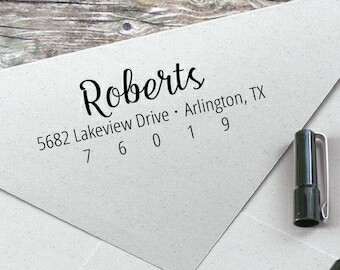 Handsome Quality Pre-inked Rubber Address Stamp, Customized for you, to make your envelopes look amazing! 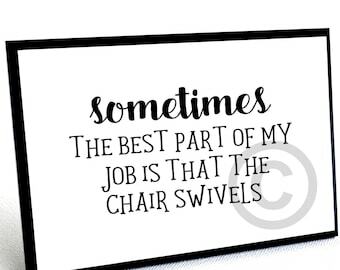 FUNNY Sayings Sign, Office Humor sign, Funny Wood Plaque, Cute gifts for her, 4x4"
I received my stamp and it is AWESOME! I cant wait to use it on my products. My dealings with the shop owner before making my purchase as well as afterwards was very professional and she was very kind. I will definitely purchase from this shop again. Making stamps, letting the ink migrate, then testing. Stamps ready to go to their new homes during the holidays. Mindy and our first order of supplies! Mindy and Peggy became friends, long before Etsy, through our kids. Mindy's two are the same ages as Peggy's two. We live less than a mile from each other in the suburbs of Denver in the foothills of the Rocky Mountains. As the last two kids headed off to college, we were ready for some new challenges. One day out of the blue Mindy, who already had a successful Etsy, came up with a great idea. "Hey Peggy, why don't you open up an Etsy shop doing custom address stamps?" Peggy agreed only if Mindy would partner with her. Mindy said yes! Through much research, trial and error, confusion and laughter our shop, Stamp The Envelope, was born. We've not looked back. 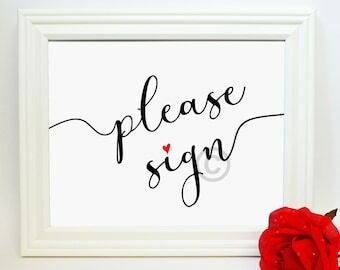 In 2018, Peggy decided to venture out on her own with another Etsy shop called https:\\www.etsy.com/shop/Thoughtfullysaid (go check it out!) So, Mindy took over the reins for Stamp The Envelope. She misses having a partner in the business, but still loves making the stamps and helping customers with their stamping needs!